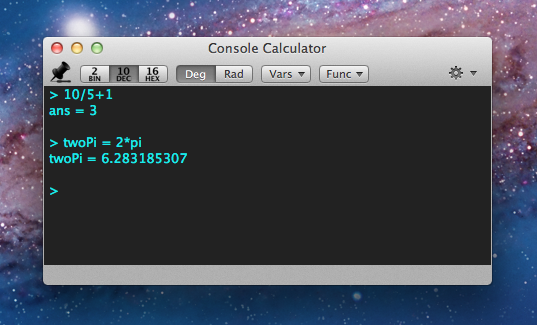 Console Calculator is a powerful calculator with a simple console interface. In addition to being a high-precision calculator (300+ bits of precision), it also supports base conversion, units conversion, and much more. The interface is convenient and easy to use. Create your own variables and functions, recall previous entries, and quickly hide it with a keystroke. Many other conveniences are included that make Console Calculator a multi-function tool that engineers or software developers will appreciate. This is already on every mac. Simply bring up the terminal “bc” and hit return. The above examples will run. If you want to add two numbers, any calculator will do, but the user interface and advanced features set CCalc apart.